Andrew I. Cohen is Associate Professor of Philosophy at Georgia State University, USA, and Director of its Jean Beer Blumenfeld Center for Ethics. 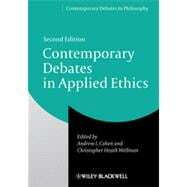 His published work focuses on rights theory and political philosophy and includes co-editorship of this volume’s first edition (Blackwell, 2005). Professor Cohen is currently researching issues concerning reparations and public contrition for past injustices that in many cases continue to inflame geopolitical sensibilities. Christopher Heath Wellman is Professor of Philosophy at Washington University in St Louis, USA. A specialist in the ethical aspects of political and legal philosophy, his books include the forthcoming Liberal Rights and Responsibilities: Debating the Ethics of Immigration (due for publication in 2013), and A Liberal Theory of International Justice (2009, with Andrew Altman), in addition to co-editing the first edition of this work.